It’s hard to choose. There’s Loano, Pietra Ligure, Varigotti, Spotorno, and Bergeggi. And on the other side of Savona, there’s Celle, Cogoleto, and Arenzano. Vacationing on the Riviera is full of choices – a walk on a sea promenade, a visit to a fishing village – destinations galore for locals and those who come from further away. These are places where the traditional vacation on the sea meets history, culture, and nature. The coast of Liguria varies from small pebble beaches nestled among the cliffs to low rocky spurs jutting out into the sea. Beaches here are not big in size, and are rarely sandy. On weekends they can be crowded. The land drops into the sea, so the water becomes quite deep just off the shore. Along this part of the Riviera, each town has lovely pebble beaches. But if you are seeking sand, check out Varazze whose fine, light colored sandy beach is quite famous, or the Spiaggia della Torre between Celle Ligure and Albisola Superiore – at the end of “Buco del prete” rock formation with a hole at its center. 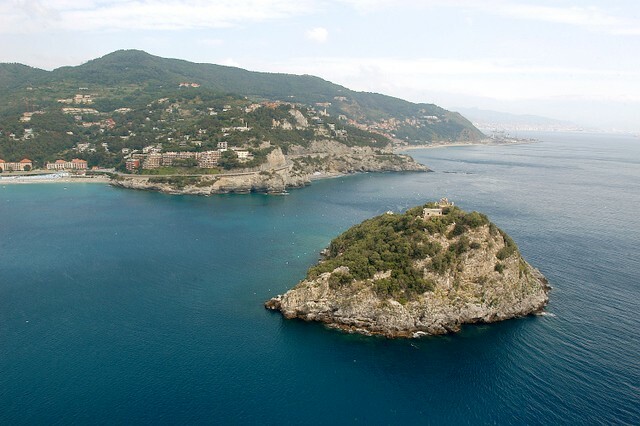 There is also the Spiaggia delle Fornaci – one of Savona’s favorites, and the beach at Noli. In front of the Island of Bergeggi, at approximately 250 meters from the coast, the scenery strongly resembles Capri. The island itself is a protected marine reserve, and holds caves of notable interest from a naturalist and archeological point of view. In addition to those cited above, along this tract of coastline, there are three towns on the list of “The Most Beautiful Towns in Italy”. Among these, the stone houses of Borgio Verezzi (30 kms west of Savona) rise up from the Hill of Orera as an almost natural rock formation above the sea. Borgio Verezzi is actually four different villages, tied together by narrow mule trails. The best known is Piazza which since 1967 warms the summer nights with a theatre festival, “Festival Teatrale di Borgio Verezzi”, in a magical setting among the stone houses that look over the dark night sea. Continuing west, a stop at coastal Finale Marina invites you to visit the village, Final Borgo, protected by well-preserved medieval walls with interspersed semi-circular towers. The town is a delight with its 15th century and Renaissance palaces, and portals decorated with columns and slate ornaments. Its narrow alleyways and piazza are the backdrop for important historic, cultural, and wine and gastronomy events. Noli too is one of the most beautiful towns of Italy. It sits on a tranquil bay, protected from the winds, strategically positioned between the hills. The history of this tiny sea village dates to the Romans. For centuries it was a Maritime republic known throughout the Mediterranean for the dedication and the ability of its inhabitants with respect to commercial and maritime activities. Since the 13th Century it has had its own bishop. The town is filled with testimonials to its glorious past, like the ruins of its castle, its towers, city walls, and its many churches and palaces. The Val Bormida carves its way through the mountains behind Savona. Past the Hill of Cadibona, the narrow valley fills with chestnut woods, leading to the town of Altare (circa 15 kilometers north of Savona). Here famous glass has been made since the XII Century. You can still visit some of the historic glass-makers. They specialize in high quality production techniques which are accompanied by artistic taste and contemporary design, making glass that is greatly requested throughout the world. The story of this tradition, together with a rich collection of antique glass and other glass items can be seen at the Glass Museum of Altare. Born as a company museum for the Società Artistico Vetraria (founded in 1856 by a family of Altarese glass-makers), it was bought by the Town of Altare in 1978. 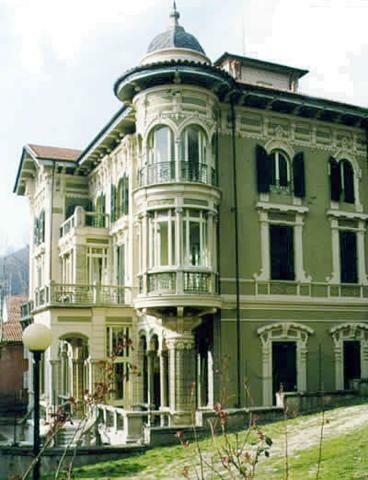 The museum is located in Villa Rosa, an art nouveau building that dates to the early 1900s and is perfectly preserved. Its collection reflects a thousand year old tradition, and exhibits glass objects and artistic works made from 1650 on to the present day. In addition, the visitor can watch videos and multi-media features that show the various phases of working glass, and also examine the tools used.